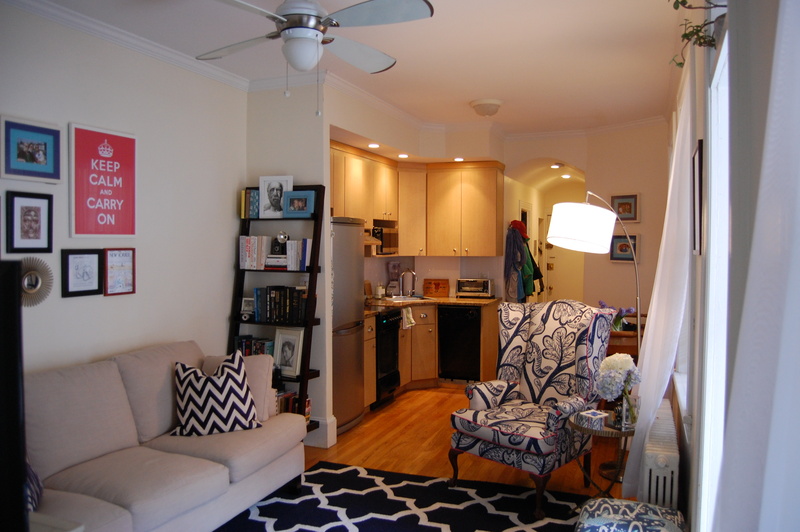 Thank you for the tremendous response to last week’s post, the big reveal of my adventure in interior design. 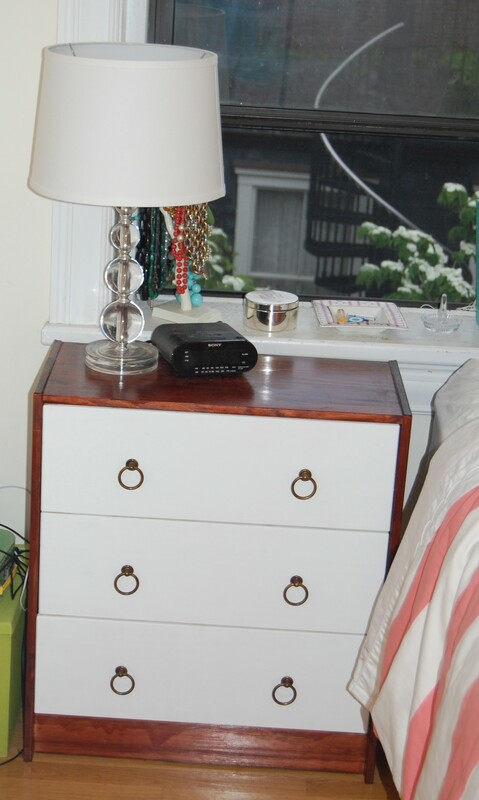 This week we move into the bedroom…cue the romantic music. As you can see the shape of my bedroom (not to mention the window and radiator) doesn’t allow for many variations in terms of furniture placement. My bed could only really go one place, so there it is. 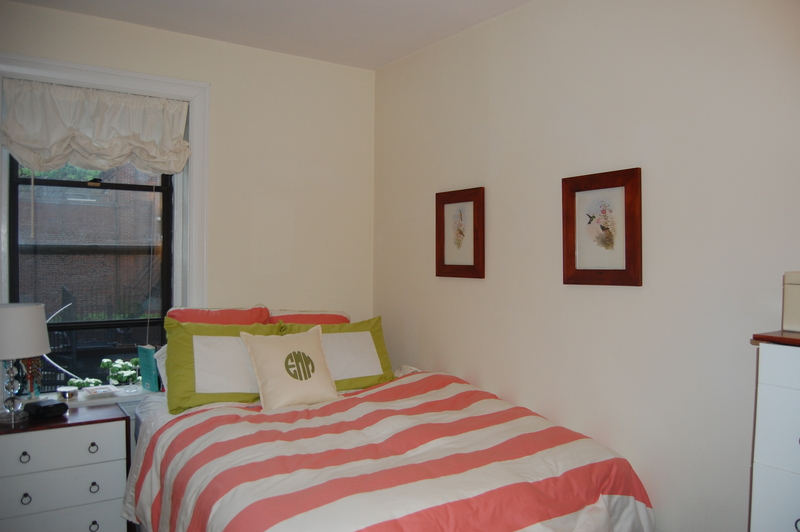 I’m using the same Serena and Lilly bedding that I had in my last place, although with these eggshell colored walls (which sadly I am not allowed to paint) the pink and green seems a little bit more in your face than before, so I may change my bedding in the coming months. 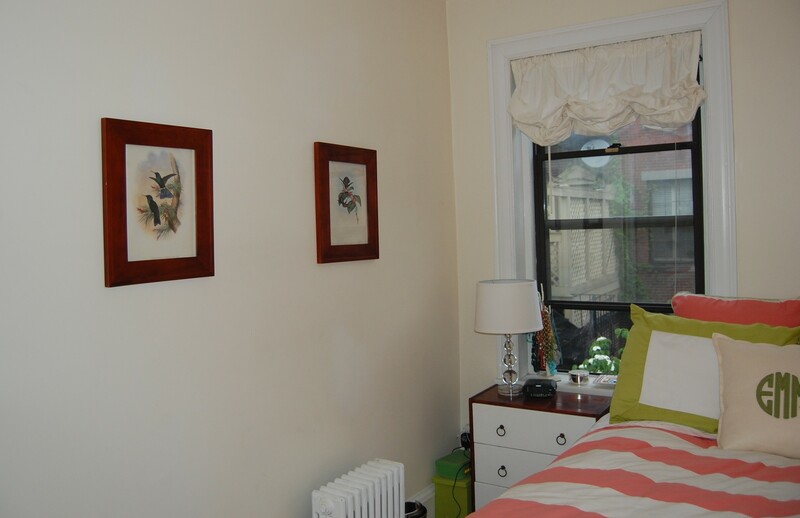 Because the room is an odd shape, I really didn’t want to invest a tremendous amount of money in bedroom furniture that fits in this small space, but may not be the right proportion for a larger room I inhabit in the future. 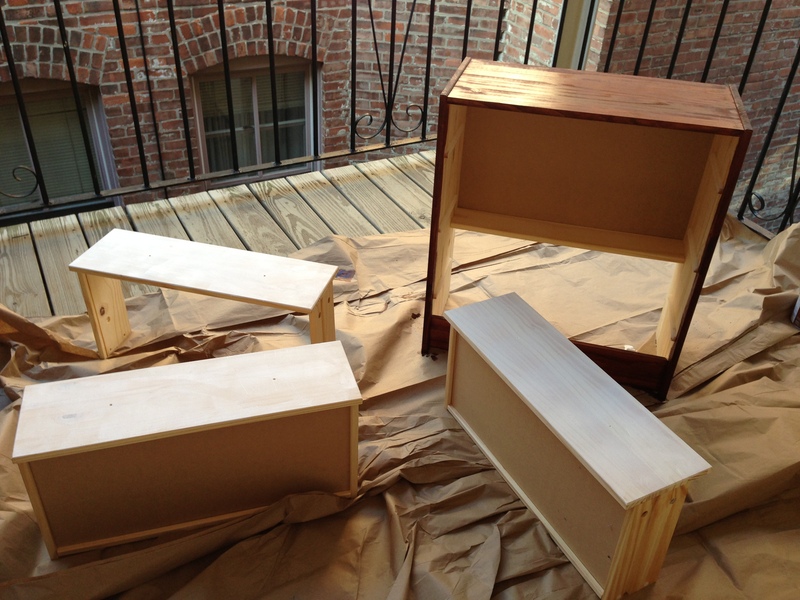 In addition, and perhaps more importantly, I wanted to impress you all with my craftiness, so I decided to Ikea Hack! I didn’t realize this was a thing until I stumbled upon this Apartment Therapy post and realized there was a lot I could do with a raw wood piece from the Swedish furniture maker. It’s a cottage industry. I started out with the rast table (above, at an amazing $34, I’ve paid more for a lunch). Sitting in my living room with a dozen pieces of raw wood covering the floor gave me terrible flashbacks of college, but it was an easy piece to put together, and I quickly moved out to the patio to paint (high gloss Chantilly Lace by Benjamin Moore), stain (“Red Oak”) and varnish what would become my bedside table. After a few coats I added some brass pulls from Lee Valley Tools (I cannot get enough brass these days). I think it looks great and at this price if I throw it out in a year when I fall in love with a real beside table it won’t own me anything. 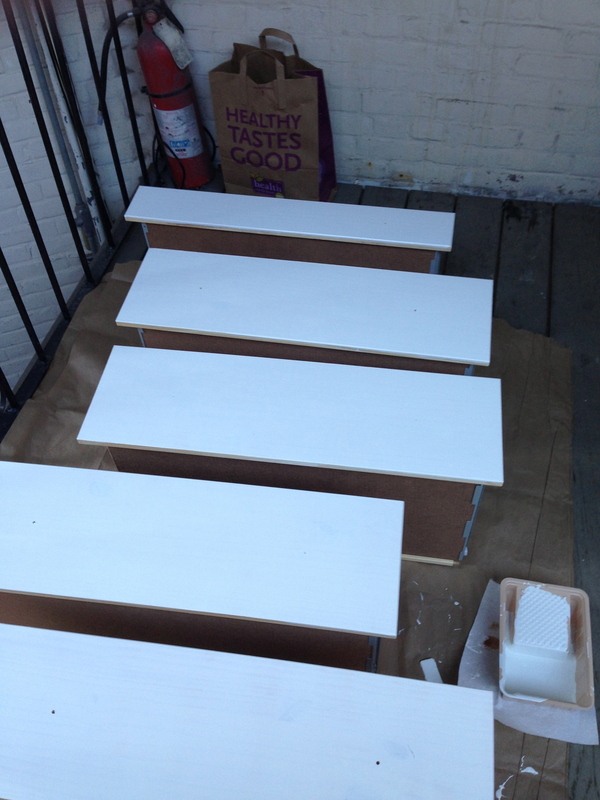 Buoyed by my success with the rast I braved the crowded maze that is Ikea again, determined to hack a matching dresser. 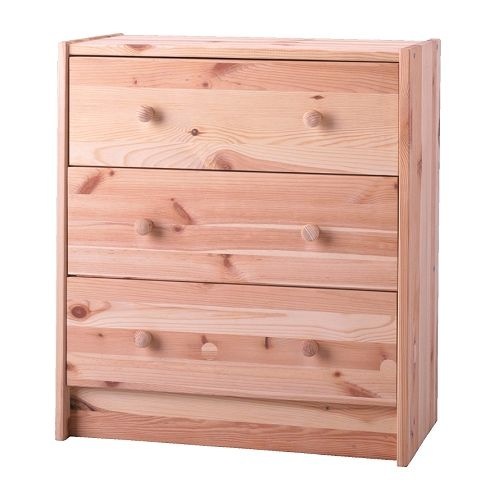 I picked the “tarva” five-drawer chest. Things didn’t go as smoothly this time around. This piece really required a drill (which the instructions did not state, even if it did, I don’t own one), and after several hours I remembered why I stopped buying Ikea furniture: its assembly has the unique ability to make me feel stupid and weak at the same vulnerable moment. As an intelligent adult I should be able to follow the instructions that are laid out solely in pictures. But I couldn’t. After sitting on my floor crying for longer than I care to admit, I called in reinforcements in the form of my friend Chris, who saved me by putting the frame of the chest together. I had to be rescued again a few days later by my dad who brought his drill up from Philadelphia to help me assemble the drawers. Sometimes you just need a handyman…or handy men. 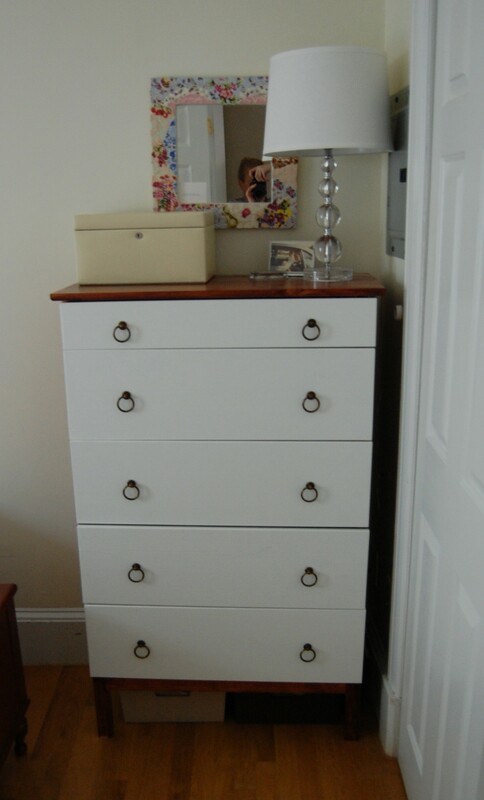 While the finished product does look good, if time is money than this dresser is worth a fortune. With my Ikea hacking behind me (thank goodness), it was time to turn my attention to the walls and attempt to make my room look a little less like a padded cell. I was on the hunt for some vintage illustrations on the website of the New York Public Library (a great resource), but I abandoned that effort when two friends and I started planning a trip to the Brimfield Antique Show this past weekend. 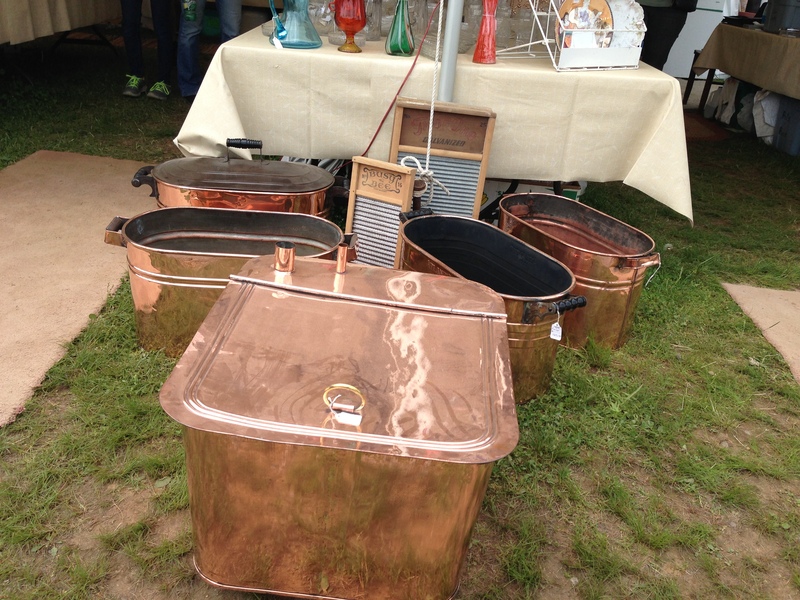 For those of you who don’t know, Brimfield is a HUGE outdoor antique fair with hundreds of vendors. 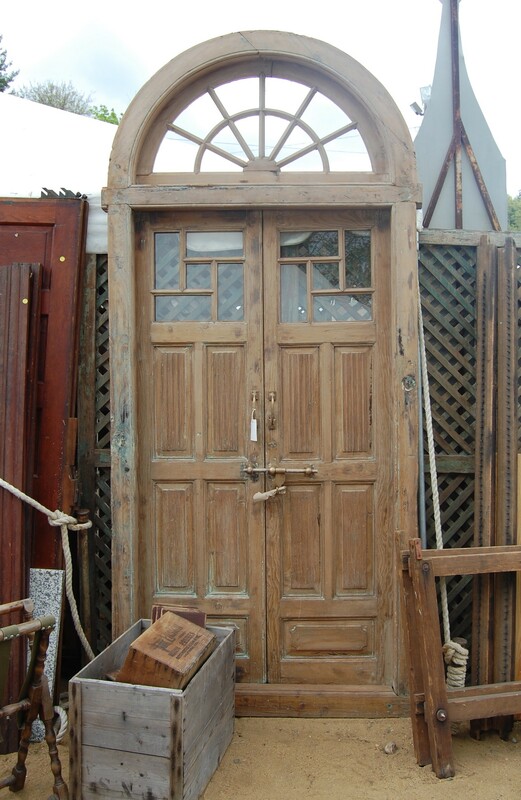 It’s held three times a year in the town of…you guessed it…Brimfield! I had stopped by a few years ago while driving from Boston to New York, but didn’t spend much time because it’s so enormous and I quickly got overwhelmed. This time we were strategic: we discussed what we all were looking for so that we could keep our eyes open for each other and stay on track. 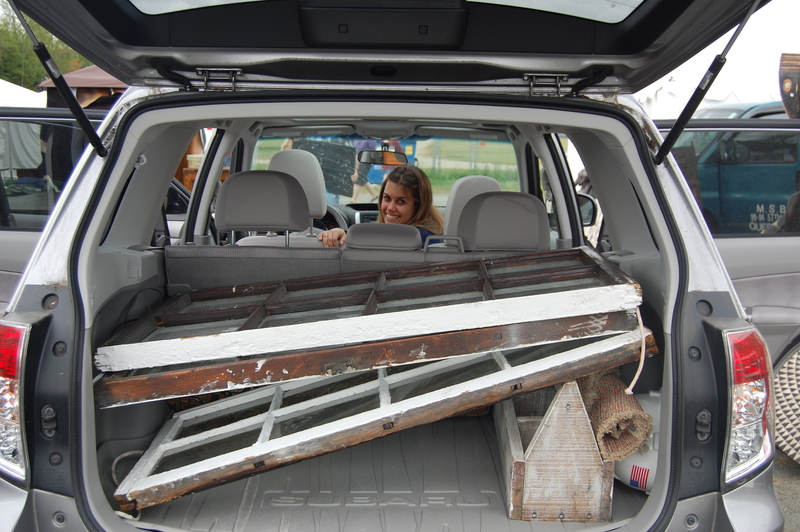 Brimfield is an experience, to say the least. We went on the last day when many vendors had discounted their items and were willing to haggle. Walking around looking at all the treasures I wished I had been able to go before I picked out all the pieces that now populate my tiny place. There were so many unique pieces, and so many items that I would love to upholster!! It was so easy to get overwhelmed by all these beautiful—and in some cases odd—things in every direction. I was glad the three of us had set priorities; they helped me stay the course. I found an old illustration of Columbia’s first campus (an ode to my J School days) in a goldish frame. 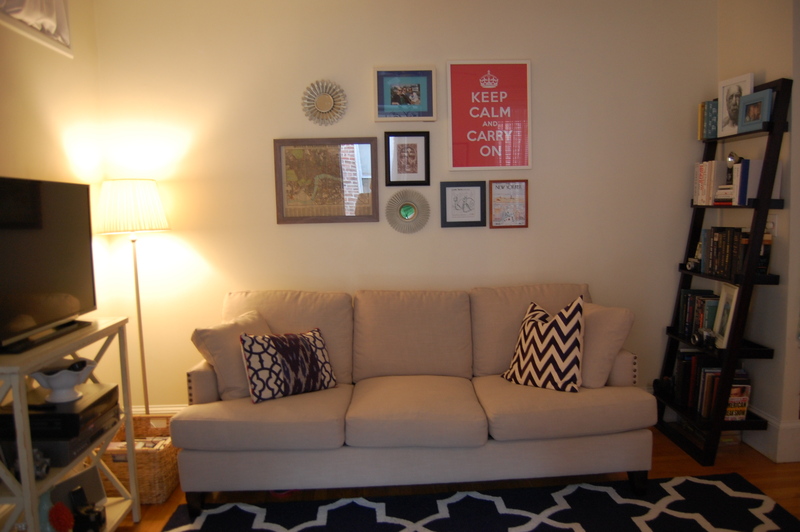 After bartering its seller down, and re-stringing some twine for hanging, it has filled in the missing piece in my living room’s gallery wall. 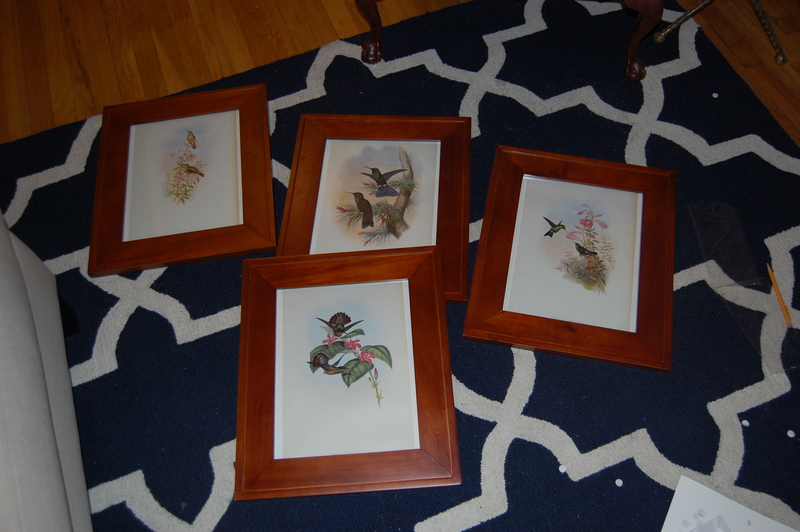 I also found four vintage bird illustrations, each had touches of pink so I hoped they would work well in my bedroom. 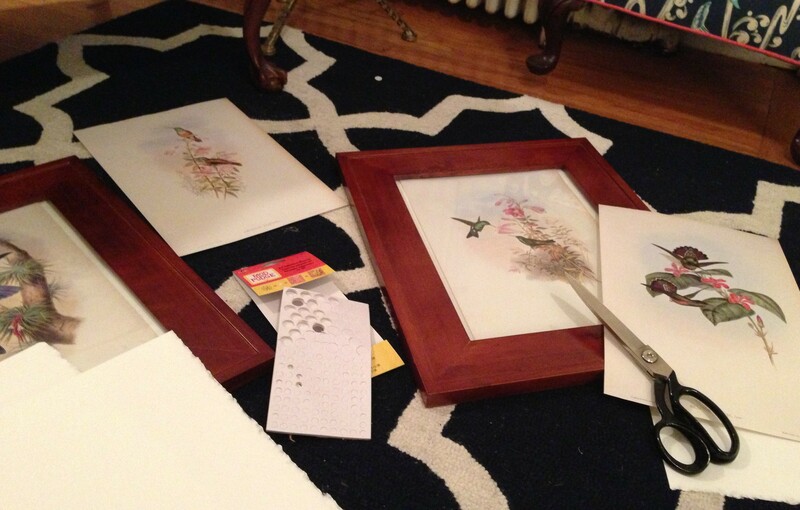 They are an odd size so I got crafty late last night (nothing like a blog post deadline to end procrastination) to make them work in the frames I picked out. I used pop dots (my favorite crafty go-to) as spacers so the illustration appeared to hover above white textured construction paper I picked out. 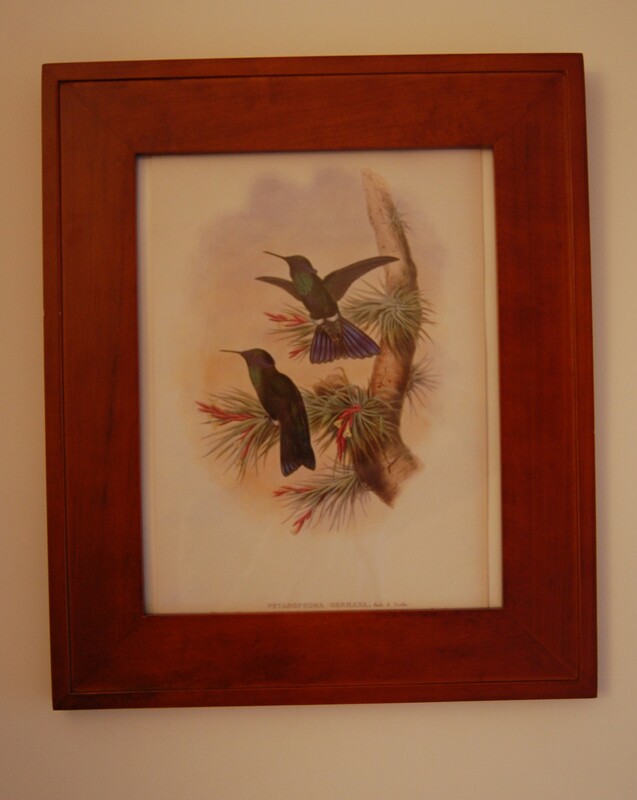 It makes them look more polished and makes my at-home framing job look more deliberate. The shape of the room still makes it feel a little bit like a psych ward, but the walls certainly look better. I wish I could fit the entire room in the frame, but that says a lot about the size and shape of the room. 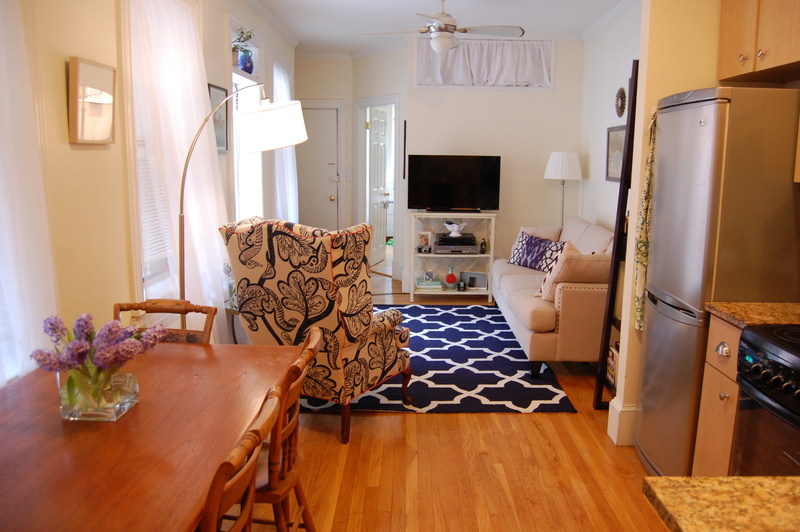 So now you have seen it; my new place! My adventure as an interior designer will continue, it’s a process and I still have some items to pick up (gradually, as my bank account replenishes itself I need to find a headboard, but the fact that my bed inches past the window is making my decision hard, I am thinking something like this) but I’m happy with it so far. I have to thank you for all your wonderful comments, tweets and all the encouragement throughout this process. It was so nice to be able to share my handiwork with you! Ready to head back to Boston with our treasurers! It has been two month since I moved into my tiny new apartment. While the last several weeks have been an exhausting mix of moving, furniture assembly, organization and more trips to Target than I expected, it’s been so fun turning this space into my home. I told you all that I was going to learn some tricks from an interior designer, but that didn’t work out so I’m going it alone. I was disappointed at first, but it’s made for more of an adventure. I can now also claim that I did this all by myself, and I’m really happy and proud of the (nearly) finished product. To add to the challenge, I am working on a very tight budget. All this is not to say that I don’t have a lot more to do, but here’s an update on all that I have been up to. 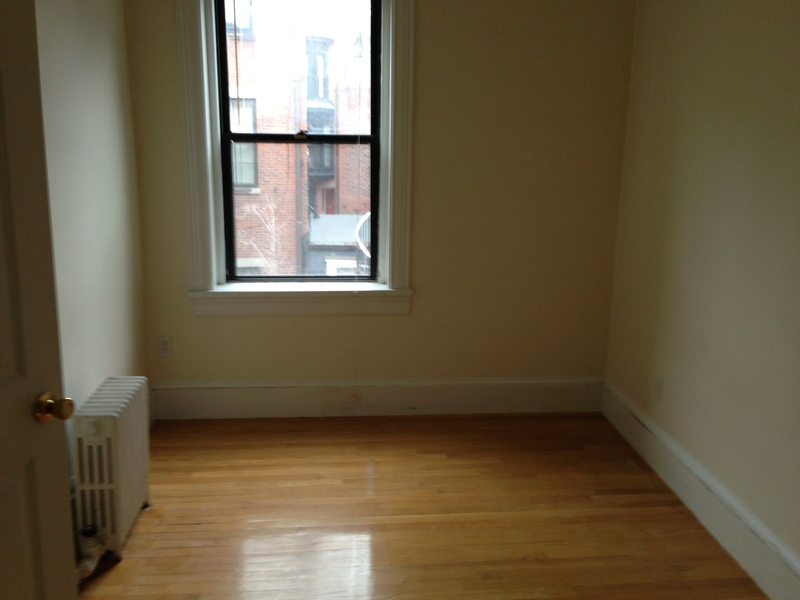 Please remember I didn’t really have any furniture (I sold it all when I moved from NYC to Boston). 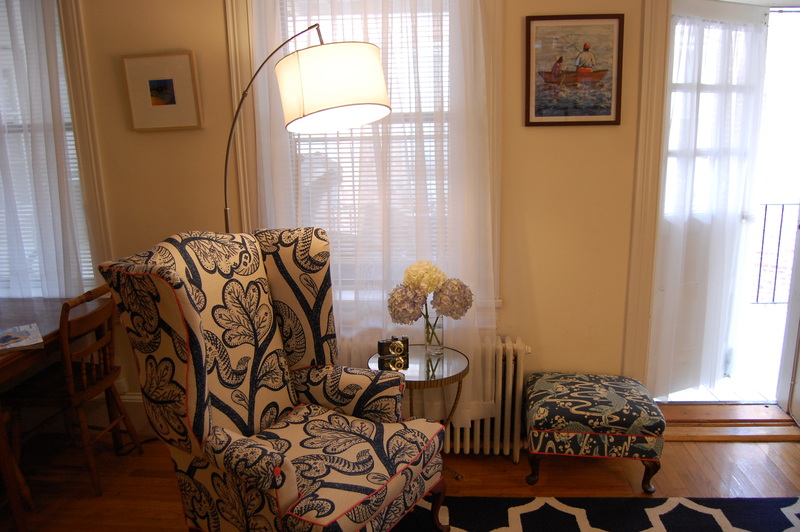 I showed up on Beacon Hill with the wing chair, ottoman and piano bench that I upholstered, but that’s about it. As a result, I was able to build the entire room (one of the two in the apartment) around those items, specifically my beloved chair. I focused on navy, white and pink for the room. The table and chairs in my kitchen came from my grandmother’s house (by way of my aunt’s basement). Thankfully the table is the perfect size for the small kitchen, but has two additional leaves embedded in the table I can use for dinner parties. I had been dreaming of a navy velvet sofa (Did you know that Jonathan Adler has a line at JC Penney? ), but decided to go neutral because this isn’t my “forever home,” and who knows where I will be (or with whom) in a year or two. I fell in love with the brass nail heads of the Vaughn sofa from Boston Interiors, and the price was right. The folks at Boston Interiors were so nice and left me along to waffle between a few styles for nearly and hour while entertaining my fellow shoppers by face-timing with my mother throughout the showroom. With that purchase made, I was able to have fun with the rug. 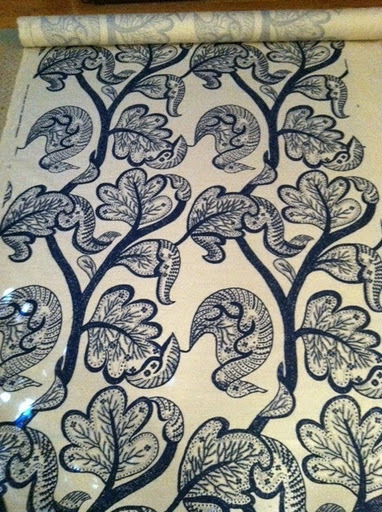 I picked this trellis pattern in navy and white. I was this close to choosing a chevron pattern for the floor, but I think chevron’s moment in the trendy sun is just about over. Instead, I picked a chevron pillow. I figured it was less of an commitment. I’m pairing that with a Kim Salmela pillow that ties in the trellis of the rug, with an ethnic print (reminiscent of the ikat of my upholstered bench) with pink welting in a shade close to that on my chair and ottoman. It was my own personal design hat-trick. The wing chair has been in constant use since I moved in, and it really needed a companion in the form of a little end table. I found this brass one at Home Goods, but you can find similar one at Create & Barrel. I love brass, and because of the sofa’s nail heads I decided to overlook the mirrored top. Not in love with that part of it, but flowers help soften the look for me. I own some lovely pieces of art, but nothing large scale enough to work above the couch, so I decided to try a gallery wall made up of some of the items I love most (prints, photos of dear friends, a map of London, a favorite New Yorker cover, a pen and ink by my talented brother, and an original Loose Parts cartoon that’s an inside family joke) plus two small sun mirror to add some much-needed texture. I went through the entire process by cutting out newspaper to the specifications of my frames, hung them on the wall, and then stared at it from different spots in the room for an hour or so to make sure I liked the arrangement. Putting the whole wall together took more time than I expected, but I’m pretty happy with the end product. I’m looking for one more item with some texture for the upper left corner. If you have a suggestion please send it my way! 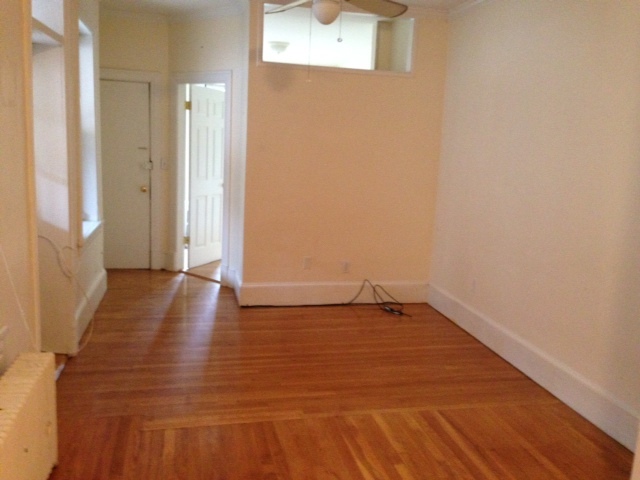 I’ve held off having an official housewarming party because I want the space to be “done” before I have people over. In the past I’ve offered advice to friends who are decorating to cut themselves some slack, don’t rush the decorating process, and take time to see how they use the space before committing. I haven’t been able to take that advice to heart. I’ve been stressed about the shade of blue on a pillow, and a back ordered coffee table sent me into a tailspin (speaking of which, I now think I’ll be getting this Lucite one from CB2 so that it visually disappears into the room). I seem to be projecting a lot of my feelings about myself onto my apartment. I only want my friends—and you—to see it when it was finished and perfect! I finally did have two girlfriends over for wine a week ago, and I was prepared to explain why this or that was not complete, or when the patio furniture is arriving (next week, just in time for summer), but I didn’t need to explain the state of my apartment to them. They loved it—the work in progress that it is—just as they love me (also a work in progress). When will I learn? 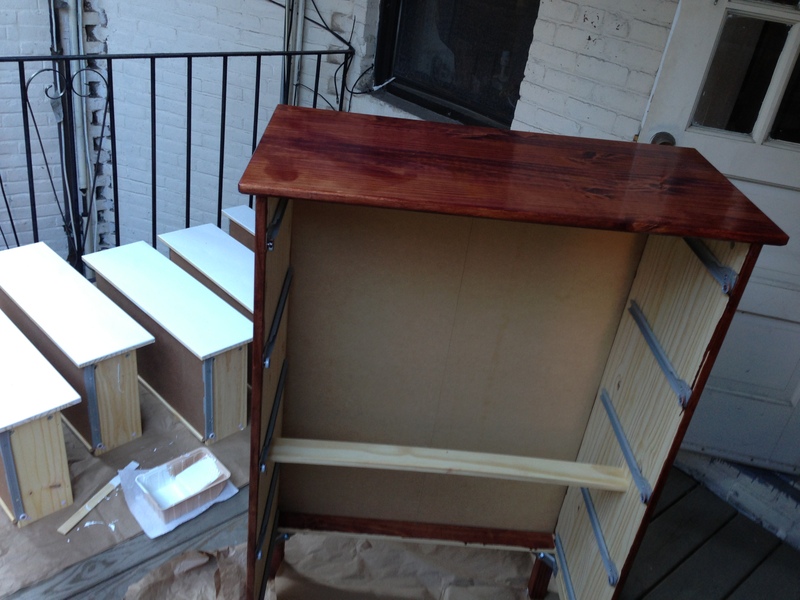 Next week the apartment tour continues in my bedroom where my craftiness was pushed to its limits. Stay tuned. I hope all of you on the East Coast are safe and sound following Sandy! I rode out the storm working from home and getting into the Halloween spirit by carving a pumpkin. That’s right, Halloween waits for no hurricane. I am sure you stocked up on candy, in addition to your pre-Sandy supplies. I certainly did. Sunday night while many people were buying water, bread and batteries, I was at Target buying a pumpkin, and yes, I did get some odd looks in the check-out line. 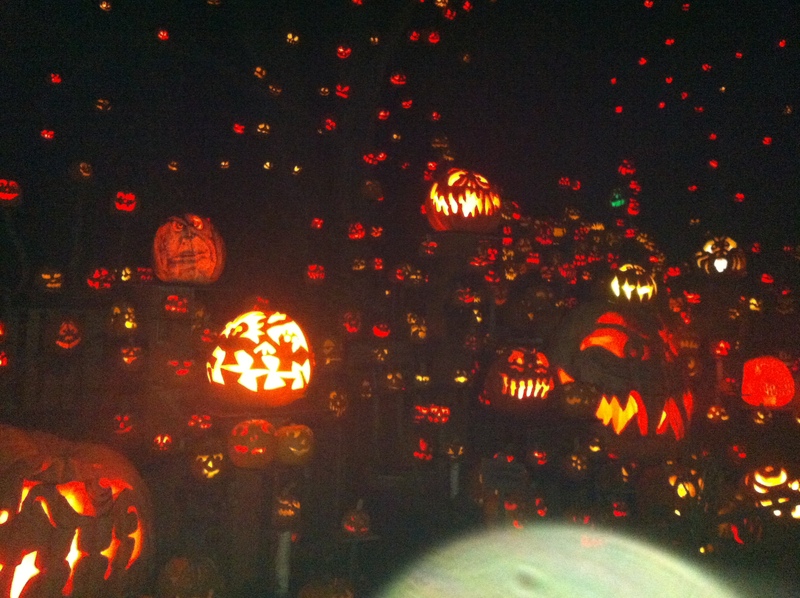 I was inspired to get into the holiday spirit by a recent visit to the Jack-O-Lantern Spectacular at Providence’s Roger Williams Zoo, and it certainly earns its “spectacular” moniker. 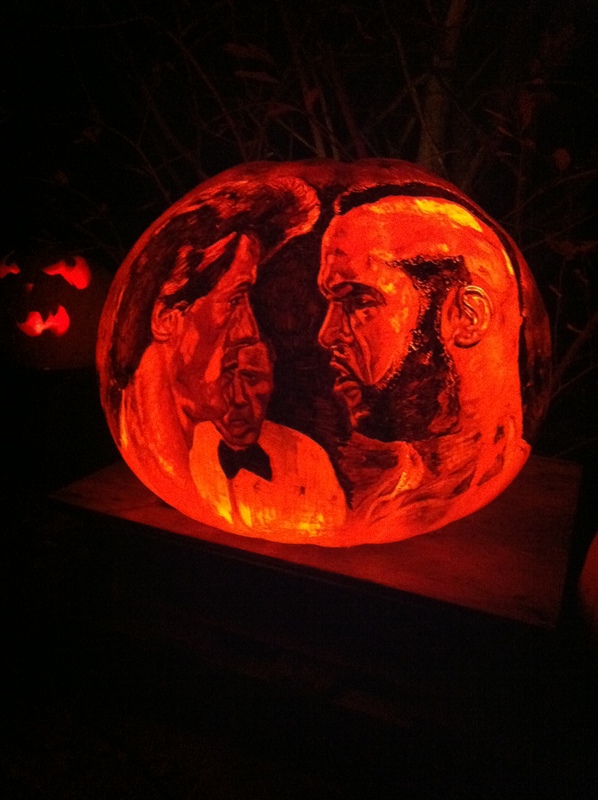 This year’s theme was “All the World’s a Stage,” with scenes and characters from iconic movies, plays and TV shows coming to life through 5,000 jack-o-lanterns. Some are carved in a traditional way, and others with intricate scenes on the surface of the pumpkins, and illuminated from within. My prose cannot do these gourds justice, you really have to see it to believe it. I was lucky enough to get an expertly guided tour from the man behind the pumpkins, Travis Reckner. The seeds of the pumpkin spectacular (pun intended) were planted years ago when Travis was 15-years-old and he and his father organized a much smaller show to raise money for a local school. Their pumpkin displays gradually grew, year by year, from hundreds of pumpkins to thousands. The Roger Williams Zoo had been the home of the spectacular from 2001-2004, and it returned in 2009. With one more week left in the season, there have already been more than 90,000 visitors who have streamed through the zoo to get a peek at the creations that Travis and his team of 20 create and refresh on a weekly basis. They work around the clock, and their hard work is evident when you see the results. Travis – a chef, and alum of Cambridge’s Rialto — uses special tools to create this pumpkin wonderland, including vacuums and instruments that are designed to cut linoleum. 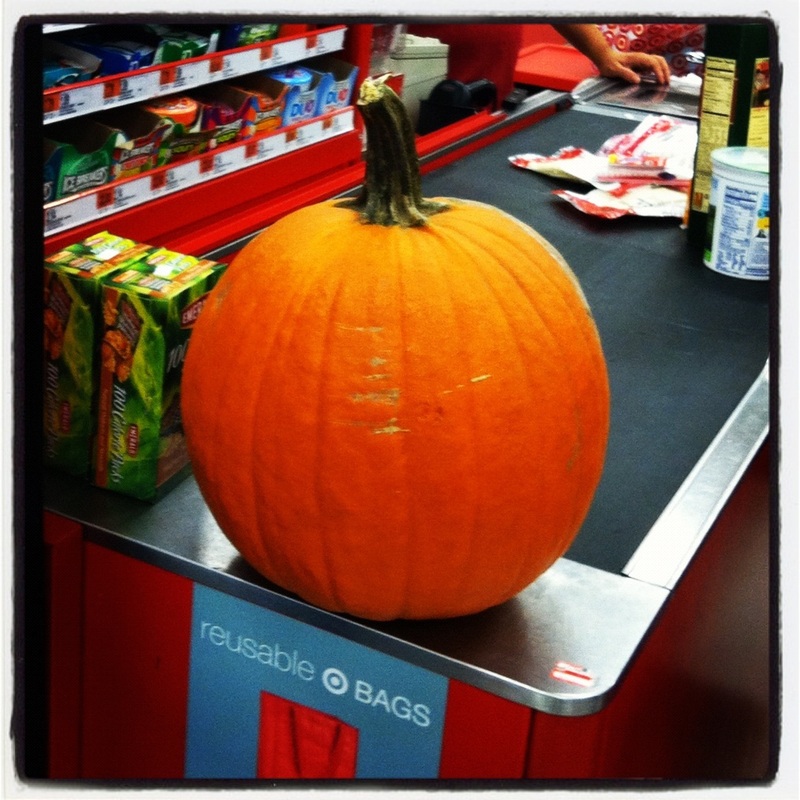 He unabashedly admits that pumpkins are his passion. He says he and his team even get a little depressed this time each year, during the waning days of the spectacular. 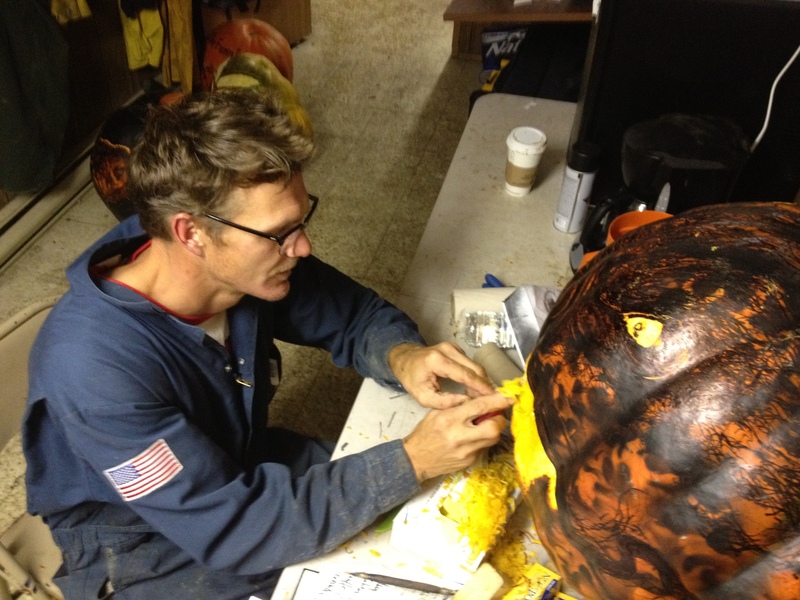 Travis’ story is an inspiring one, in that he found his passion in a non-traditional area, pumpkins, and he has carved out (again, pun intended, I am on a roll) a job that allows him to do what he loves. Sometimes the thing that makes us happiest doesn’t come in a neat, easy package. But if we listen to our hearts, and don’t give up, we can find a way to follow our passions! 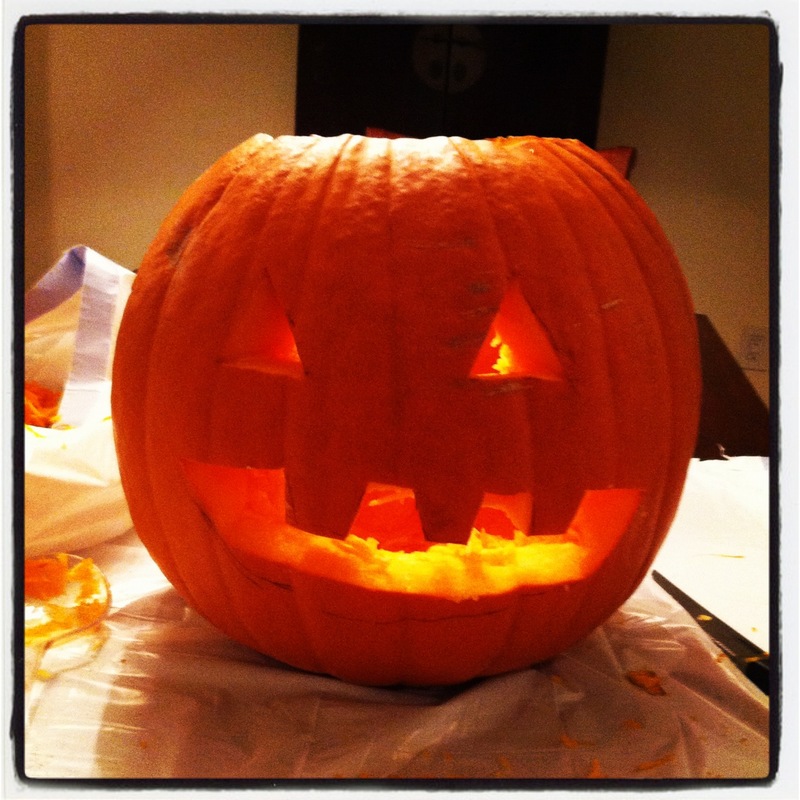 And, here is my jack-o-lanter, inspired by Travis, and made possible by some forced down-time courtesy of Hurricane Sandy. I was prepared in case the lights went out! Obviously, I need some serious practice if I want to be able to help Travis out next year. Thanks to Travis Reckner for taking the time to share his passion with me. 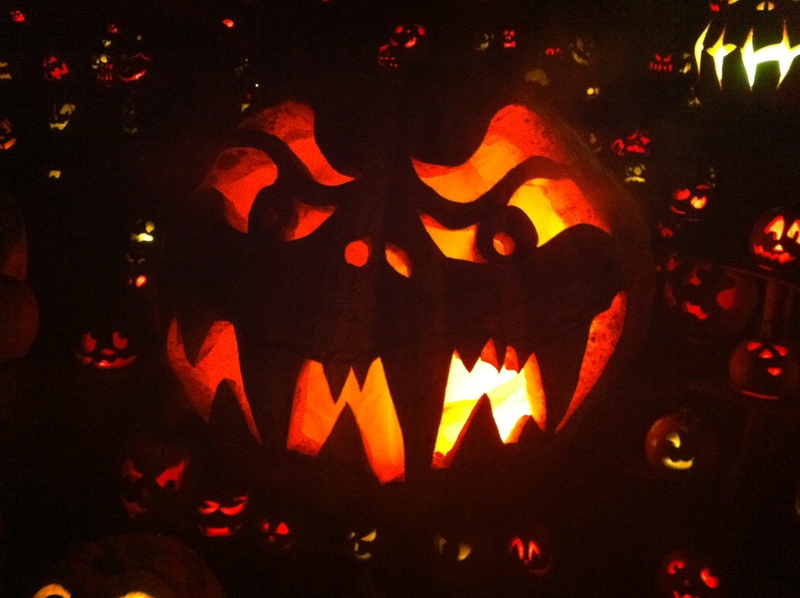 The Jack-O-Lantern Spectacular is not to be missed. After going toe to toe with Sandy, it will reopen on Halloween and will be open through Saturday, November 3th. 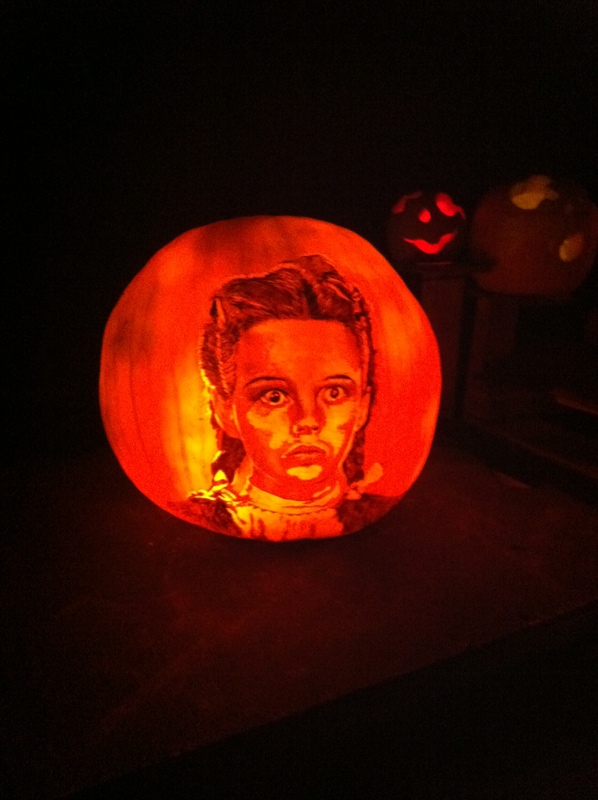 Thank you as well to Whitney Dayton Brunet, it would have been depressing to carve alone. What is Toyidermy you ask? Good question. To get the answer I spent Sunday afternoon laughing and crafting with the creator of Toyidermy; the blogger and my friend, Kelly McAuley. 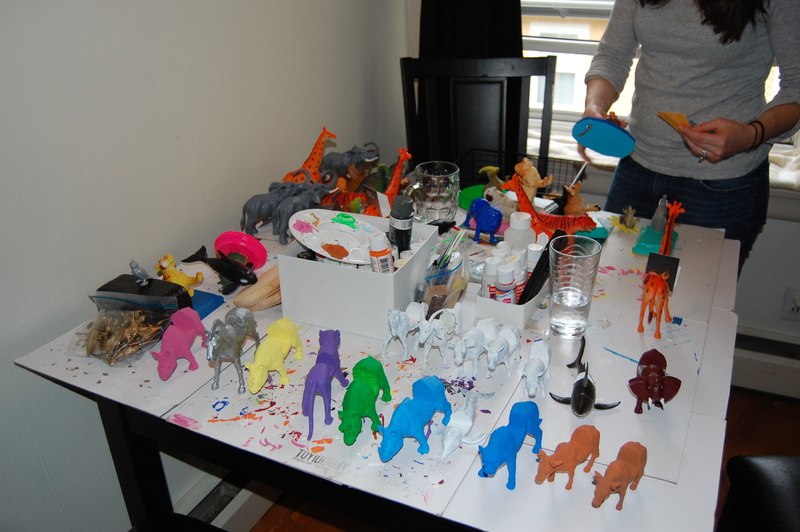 In the simplest terms Toyidermy is like taxidermy, but with toy animals instead of dead ones. 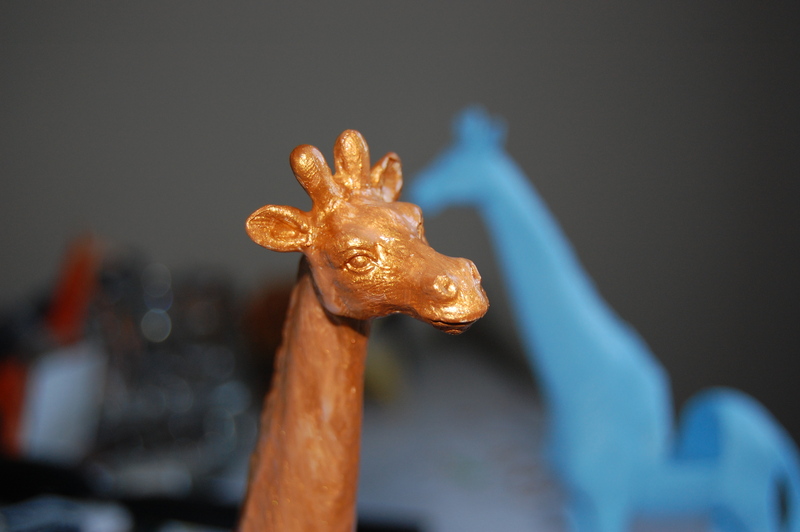 Kelly’s creative juices started flowing after she saw a set of golden animal place card holders for sale at Anthropology. Crafty since childhood, the set’s price tag made Kelly wonder if she could make her own. 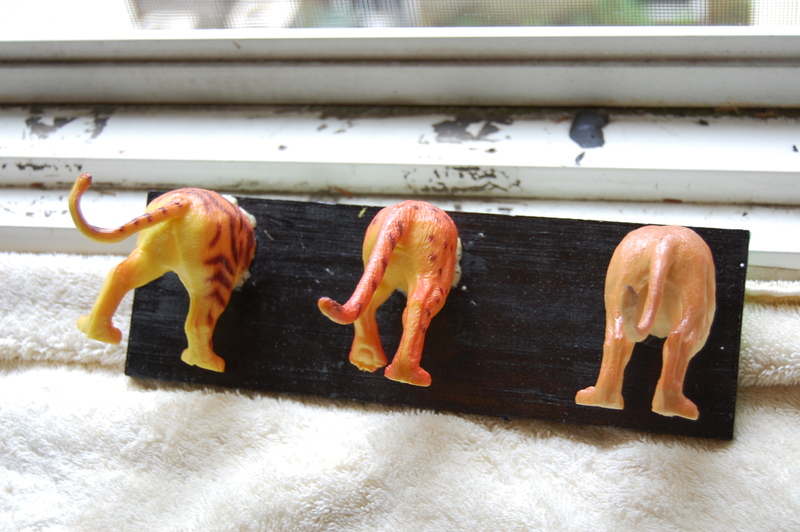 She purchased a jug of rubber animal toys and got to work. She dubbed the result Toyidermy, and her creations are sweeping, if not yet the actual world, at least the etsy world! 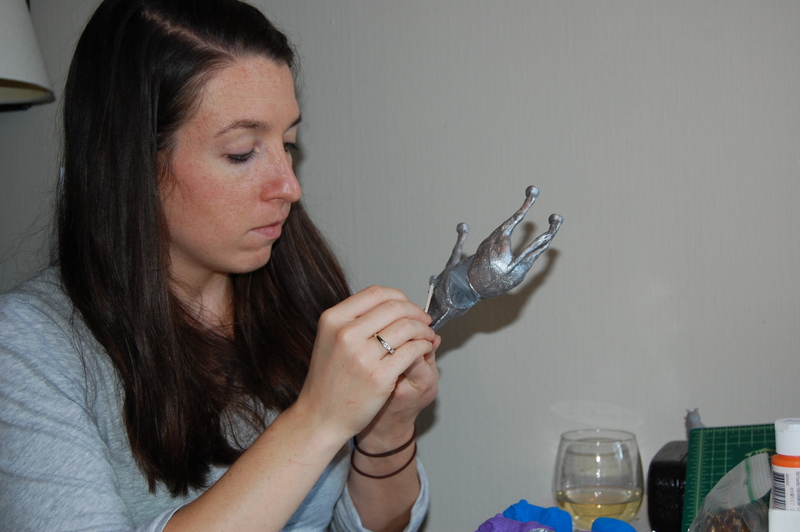 After creating her place card holders, Kelly branched out to wall mounted animal heads – and butts – business card holders, pins, coasters and even wine stoppers. She is customizing some species for football fans (think the Auburn tiger), and with the election and then holiday season right around the corner I can’t wait to see what she comes up with next. During our afternoon together Kelly let me make my own business card holder. She asked me what my favorite animal is, and although she did not have a llama (which seems to be popular only with me and other Sesame Street kids from the 80’s), my giraffe was clearly an amazing second choice. We started by doing a little surgery on my own personal Sophie (please note, no plastic animals were killed in the writing of this blog). This was more challenging than it sounds. I learned I am not the most graceful or efficient with an exacto knife. I got a little intense while sawing my giraffe, which made both Kelly and me laugh once she broke me out of my stress-trance. Leave it to me to get bent out of shape over a rubber animal. But I snapped out of it, and quickly got back to having fun. 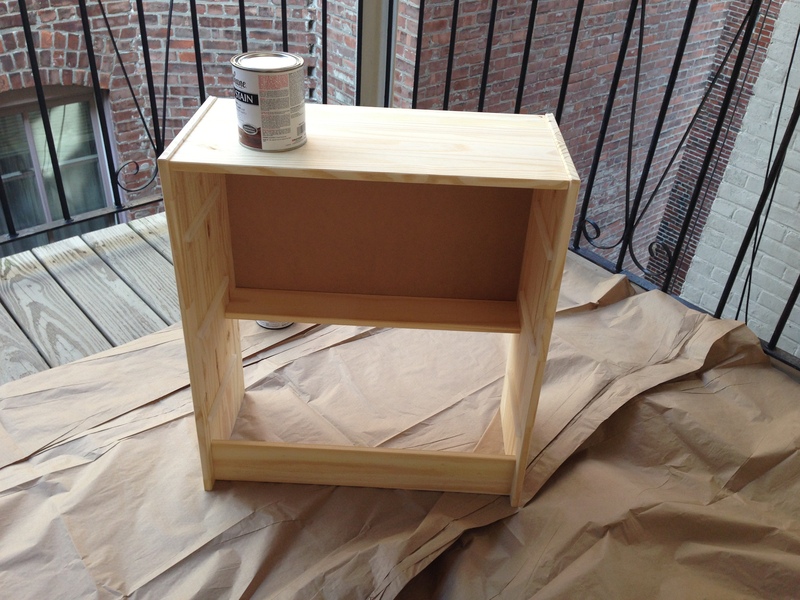 We created a shelf-like back section to hold the business cards and then started to paint! First we slathered on a white base coat, let it dry while we sipped some bubbly, chatted and touched up some other member’s of Kelly’s menagerie. 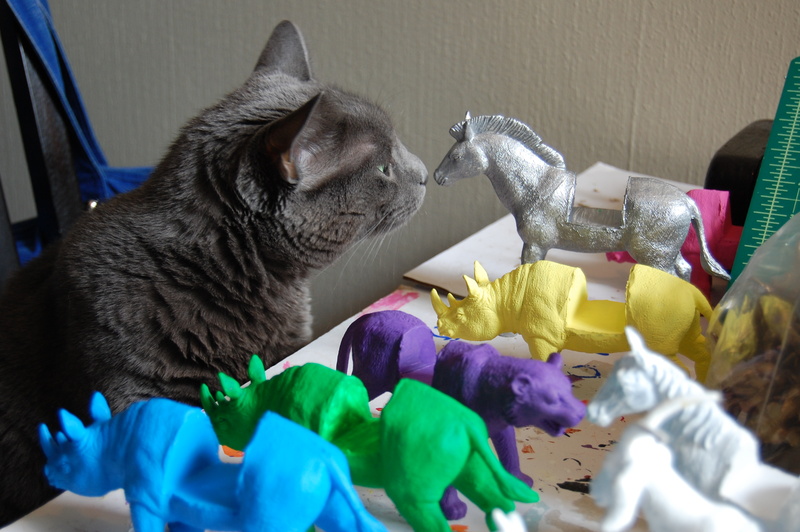 Then the tough part: choosing the perfect color for my toyidermy masterpiece. I went with a metallic gold, which I am loving, but Kelly has every color of the rainbow and then some. 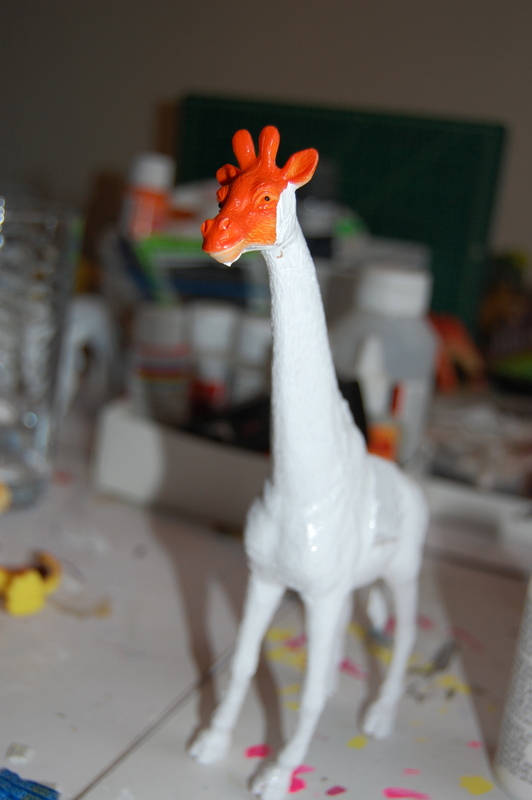 While I managed to get paint all over myself, I was also able to coat my giraffe as well. 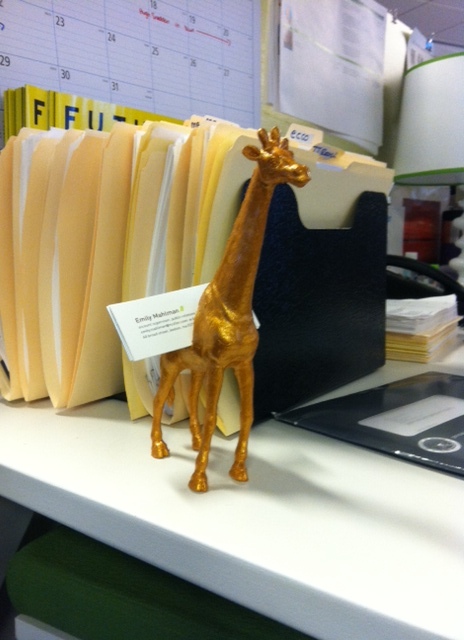 On Monday my new friend from the jungle was situated on my desk with my business cards gently nestled in it’s back. 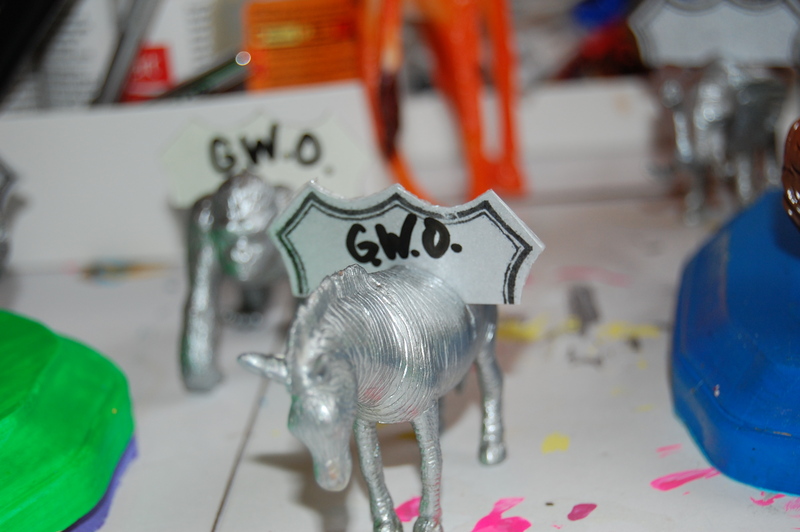 I work in a “creative environment,” one in which I’m sometimes not sure I exactly fit, but my toyidermy seems to be earning me some much-needed imaginative street cred. Another aspect of the afternoon that was great was hearing more about Kelly’s toyidermy odyssey. 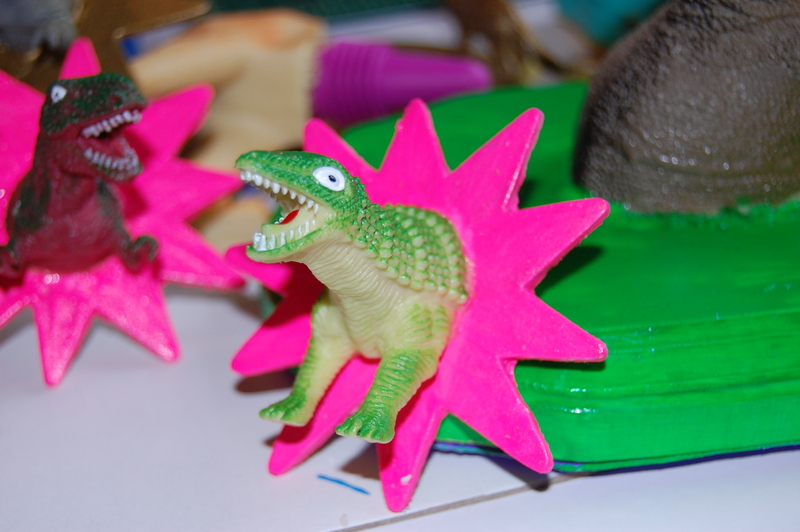 She started creating these little creatures on a whim, but despite the serendipitous nature of the beginning of the toyidermy tale, Kelly is making it work and toyidermy is selling like hot cakes on etsy. 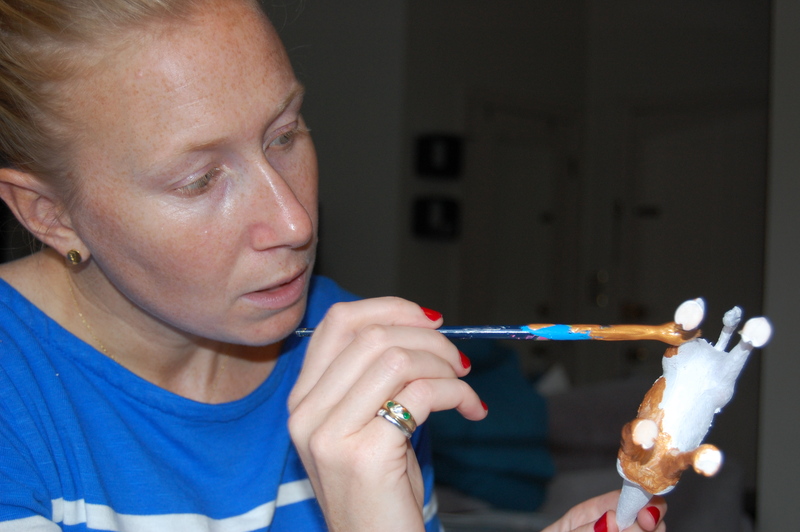 She carves up animals late at night and paints them before work, and enjoys every minute of it. That is something I can admire! Many thanks to Kelly McAuley for letting me spend the day with her. You can check out more of Kelly’s toyidermy on her website. They make great gifts and she takes custom orders. You can also check out her blog, Gets Me Every Time for more of her DIY projects as well as killer taco recipes. Those of you who read this blog regularly know that some of my “adventures” don’t always stick. After flying through the air on a trapeze, I didn’t run away and join the circus. Nor have I joined a synchronized swimming team (although I did think about it). 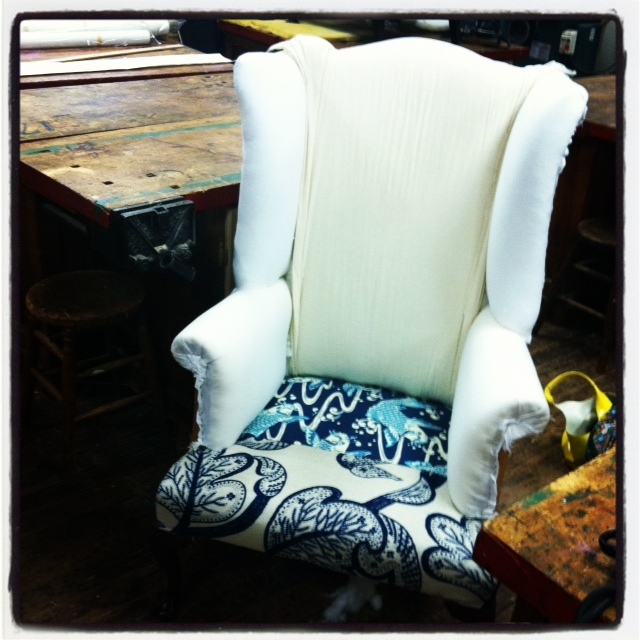 One activity that I tried, fell in love with, and have continued is upholstery. I took my first upholstery class in the early days of this blog over a year ago. I was immediately drawn to the combination of creativity and design with sheer physical effort. Upholstery has it all: I could indulge my love of color and interior design while working my day’s frustrations out by ripping and yanking a chair apart and pulling and stretching fabric into place. 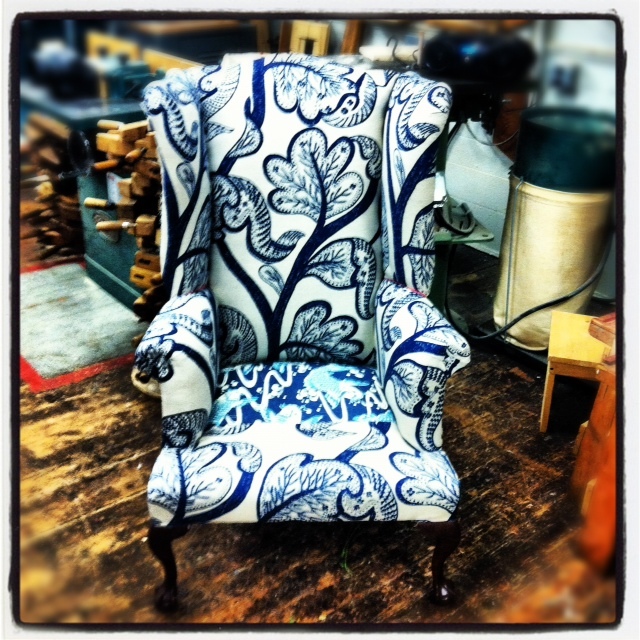 Many of you have read, and watched as I tackled my third, and most difficult project to date: a wing chair. 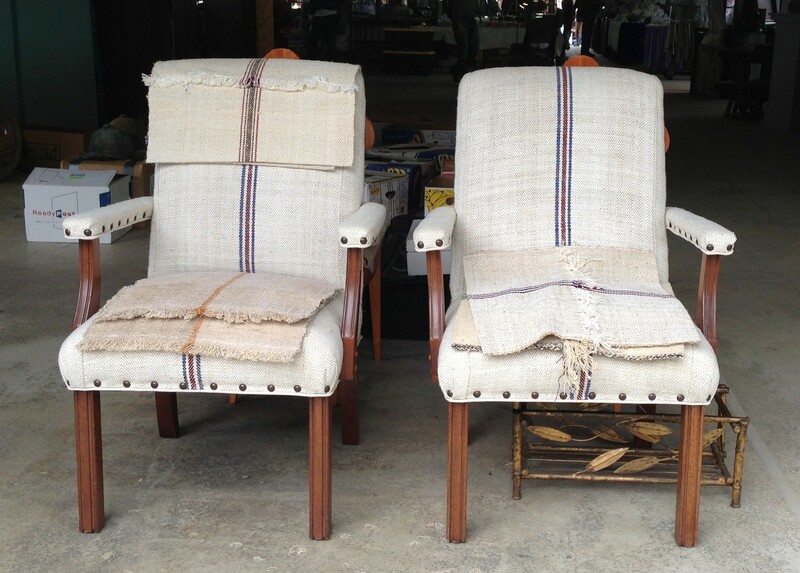 I bought the chair (and its twin) on ebay for $99 for the pair (an amazing deal) and found the Albert Hadley fabric at Griswold’s fabric outlet (a real treasure trove). 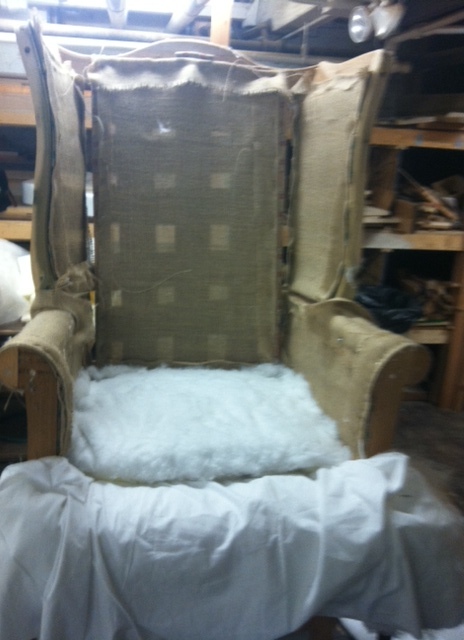 I had to rip the chair to shreds and build it back up, tightening springs, and layering cotton upon muslin upon burlap with a beautiful final layer of fabric. 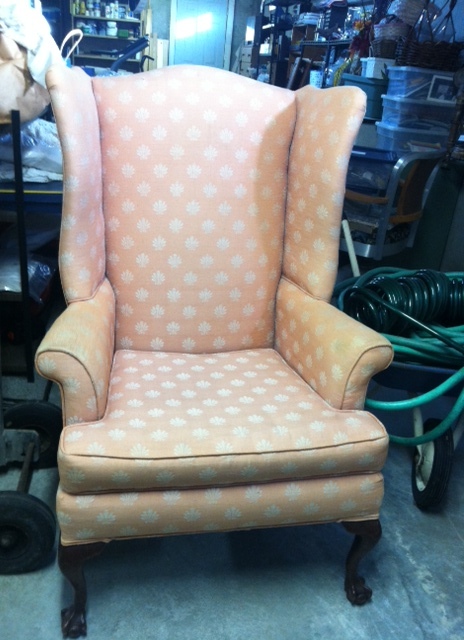 I started working on this chair in January…so obviously I am not the speediest upholsterer. I had ups and down in the process (I even broke my chair’s leg on Valentine’s Day…I have that effect on dates), and I needed a lot of help, but I am finally finished! Many of the activities I try for this blog are challenging physically, others are a test of confidence, or even emotionally demanding. This wing chair was a test of my patience. This was a long, hard process. I desperately wanted to be (very) good at upholstering. And while this blog has inspired an evolution of sorts — I am no longer afraid of being bad at something — the prolonged nature of this upholstery project really tested this evolved version of me. I can handle being bad at something for an afternoon or event a full day. But week after week…that was starting to get to me. I was learning as I progressed, but my teacher had to correct me often and I had to re-do elements of the chair often. There was no real resolution to my frustration, but I was able to sit with it, come to peace with the fact that upholstery is a skill and art that people study for years. Who was I to expect to be good, or even proficient at it in just one year? But all that frustration melted away when I hauled my chair into the corner of my bedroom and saw how beautiful it is, how comfortable it is, and how accomplished I feel. And as I sit in my wing chair writing this post, all the hard work and frustration feels well worth it, and I can’t wait to get started on my next project. 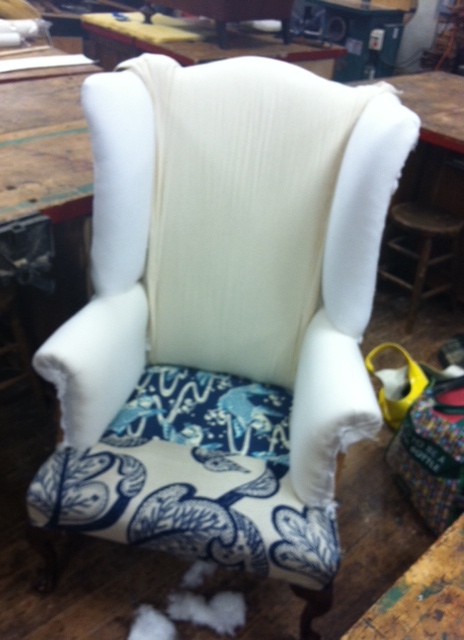 If you read this blog on a regular basis you know that one of my longest-running adventures is learning to upholster. I started taking classes at the Eliot School of Fine and Applied Arts over a year ago and quickly brought a piano bench and ottoman back to life in vivid color. 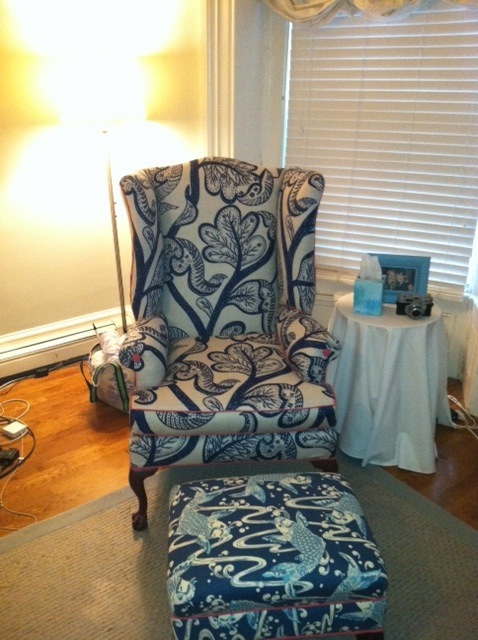 After those small victories I took on a huge challenge: a wing chair. 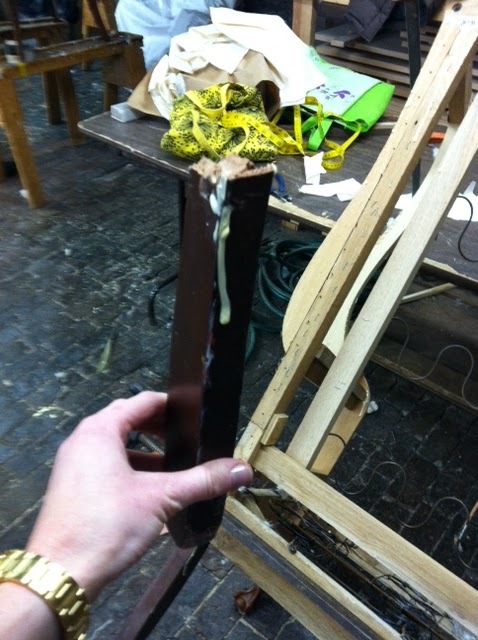 When I last updated you on this endeavor, I had broken off one of the legs of my chair in some Valentine’s Day dramatics. That one night has really epitomized the entire project: one set-back (of varying severity) after another. My teachers, Paul Devito and his son, also named Paul, managed to re-attach the leg using a lot of wood glue, along with nearly 100 staples. 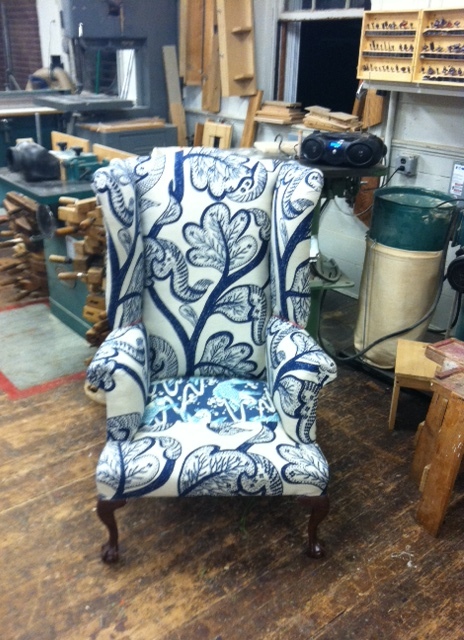 Since I broke my leg I have made slow and steady (with an emphasis on slow) progress on my wing chair. After stripping the chair down to its bones and tightened its springs, I have been building it back up with layers of cotton, foam, burlap, muslin and finally fabric. This may sound simple, but it’s not, at least not for me. I have been working at a painfully slow pace, unsure of my next move. 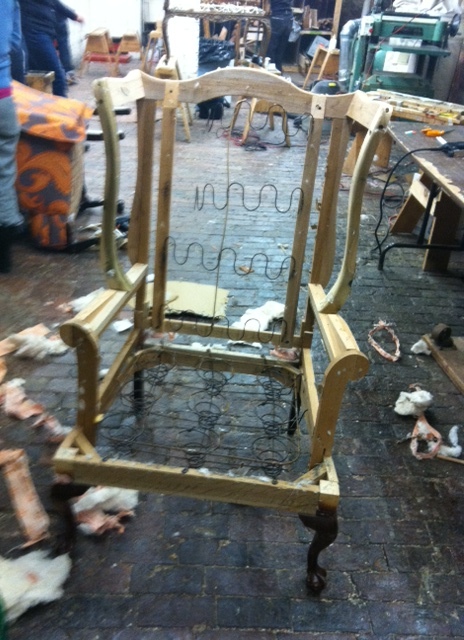 My teachers assure me that I am right on track, but I am frustrated to still be working on this chair. I realized that one of the things I liked best about my early small-scale upholstery projects was the gratification I received from finishing a project in a handful of weeks and having physical evidence of all my hard work. This style of chair is among the most difficult so I realize I should cut myself some slack, but I am not all that good at that. So this past week, when I hit a milestone (the entire front of my chair now has fabric on it), I was overjoyed and reminded why I fell in love with upholstery in the first place. But should I — or anyone for that matter – only feel a sense of satisfaction from success? Shouldn’t I be satisfied with the experience, and the fact that I am learning how to upholster as I go? Intellectually I know that answer is yes, and as I move closer to completing my chair, I will try to keep that in mind. Now, don’t get me wrong, the upholstery process has been a lot fun; my teachers are incredibly knowledgeable and patient with me. They are also hysterical. One example is featured in the video below; upholstery tacks are actually sterilized before they are sold so that they can be put in one’s mouth and pushed out with one’s lips one by one on to a magnetic hammer. This cuts down on the time it takes to tack material to the chair before you staple it into place and it’s known as “spitting tacks.” I have never had luck spitting tacks and nearly swallowed a tack mid-sneeze. After 25 years in the business my teacher is very good at this. It takes him under three minutes to do something that takes me more than 20. Plus he’s not afraid of swallowing tacks because he has done it before, three times. See for yourself. Despite all my self-directed frustrations, the upholstery process is still extremely enjoyable. After a though day at work using my brain, there is nothing better than getting physical and ripping, hammering and going crazy with a staple gun. And hopefully in the not too distant future I will have a gorgeous chair to show for it. Until that time, I resolve to go a little easier on myself, I am still just learning after all. Yes, it was a violent encounter, on-lookers were horrified. 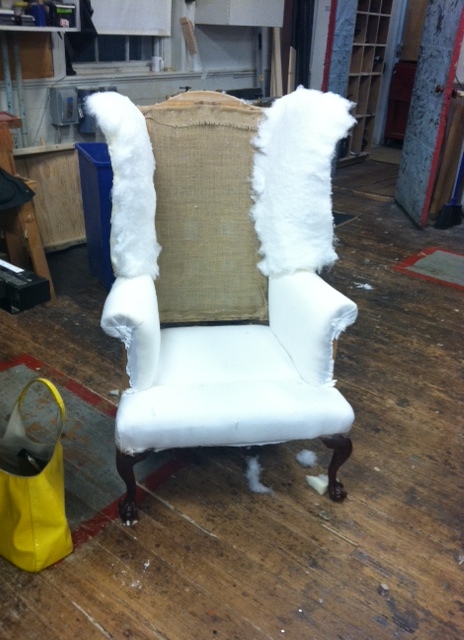 Did I mention that my valentine was the wing chair I am working on restoring? I was not going to miss my upholstery class for a half-baked holiday that makes couples force romance and singles force smiles. So yes, I spent Valentine’s Day upholstering. 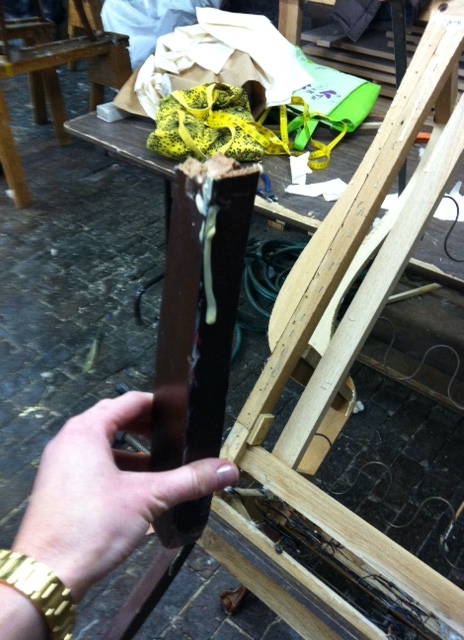 Well, there was no actual upholstering; I was trying to salvage my relationship with my valentine. Maybe I should have seen this coming, friends told me he would never amount to anything, but I saw something in my chair that I had not seen in others. I was emotional and heartbroken as I held his leg in my hand. Heartbroken that a relationship that had started out so promising — and one in which I saw so much potential for the future — was irrevocably broken, snapped in two pieces with painfully jagged edges exposed. We had a deep connection my chair and I. We were compatible on so many levels. Sure, I wanted to change him, but it was for his own good. I could see his potential. My teacher assured me that all was not lost. There was hope. It would take hard work (and a plethora of wood glue) but we could get this chair back on track and we would still have years of happy reclining to look forward to. I pulled myself together and squeezed glue all over the breaking point as if it was my only hope for a happy ending. I stuck the broken leg back in place, used some staples just to be sure, and carefully, reapplied the clamp. It was touch-and-go there for a minute, and I will not know for sure if we have a chance until I return to class next week. But I am hopeless romantic, and I think this may be it! Those of you have been reading this blog for a while know that one of my first endeavors was upholstery, and I really fell in love! I may have actually found my passion on one of my first tries! It combines the physical challenge of breaking down a chair to build it back up, with the creative challenge of choosing fabric, piping and just how cushiony you want your chair (A very important questions as I have discovered). 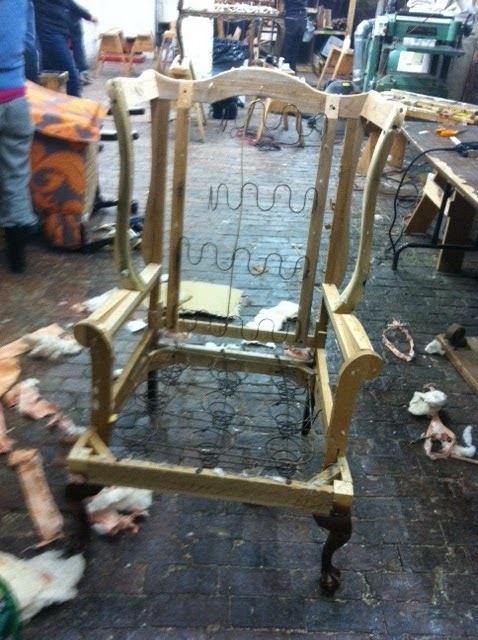 It is the ultimate form of recycling: giving a tied old chair with great bones, a brand new look and a new life. 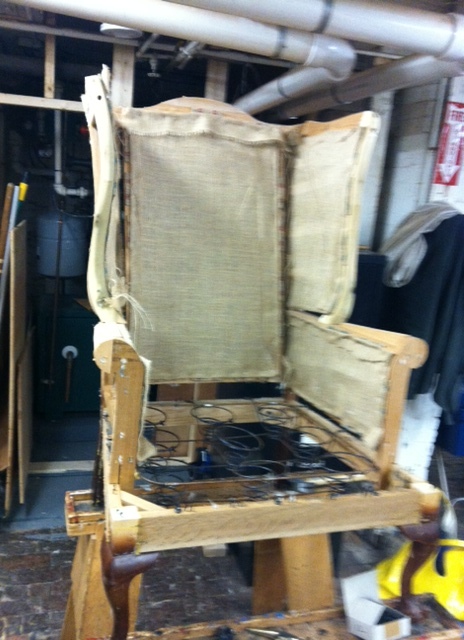 After bringing one of my grandmother’s piano benches, and an ottoman back to life, I have begun my next class at the Eliot School of Art with a very challenging project: a wing chair. 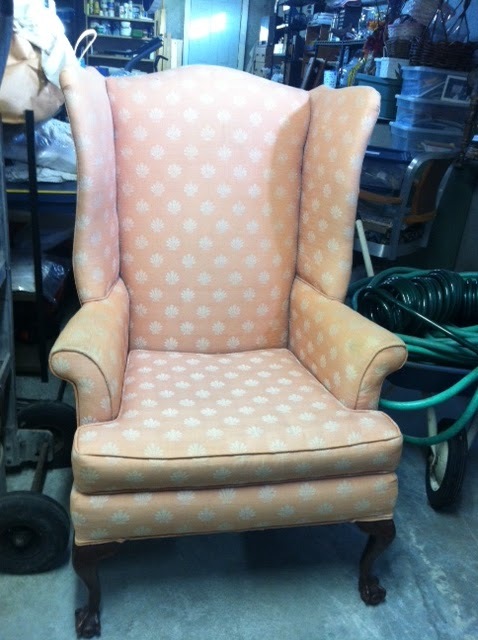 I found the wing chair on ebay for $99 for a set of two (amazing deal), and I found some gorgeous Hinson & Company fabric at Griswold’s fabric outlet (a treasure trove of designer fabric at deep discount) and hauled it all to Jamaica Plain this past week. It took over three hours to break down this chair and it was not easy (I have cuts all over my hands to prove it). I pulled out hundreds of stables, yanked the ugly, worn, peachy fabric to shreds and battled some very old, rusty springs. At one point I was standing on the naked frame of my soon-to-be-beautiful chair pulling at a tiny strip of fabric as if a mugger just stole my purse. My teacher tells me that it could take me several months’ worth of classes to finish this chair, and I will have to get very comfortable with a sewing machine. As a result, you won’t get as many updates this time around, and I won’t get the sort of instant gratification that I received from my smaller projects last spring. But I promise to post tons of pictures of the final product! 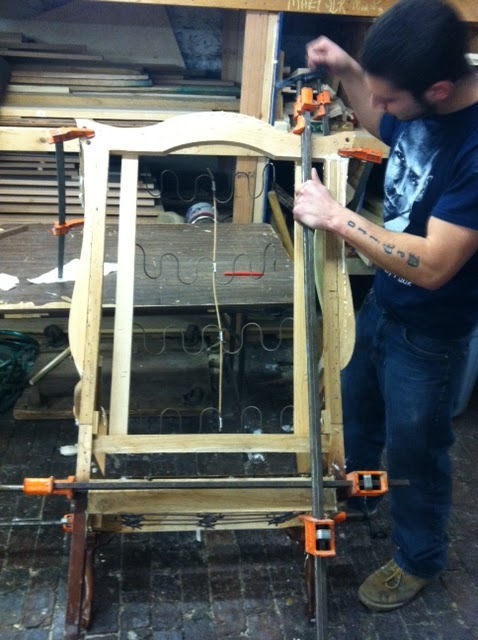 Until then I will be hard at work creating my dream chair! And those of you who have asked if I take custom orders, this project should get me to a level where I can reupholster your furniture without losing any limbs (both mine and your chairs’)! Humphrey Bogart made it sound so easy. 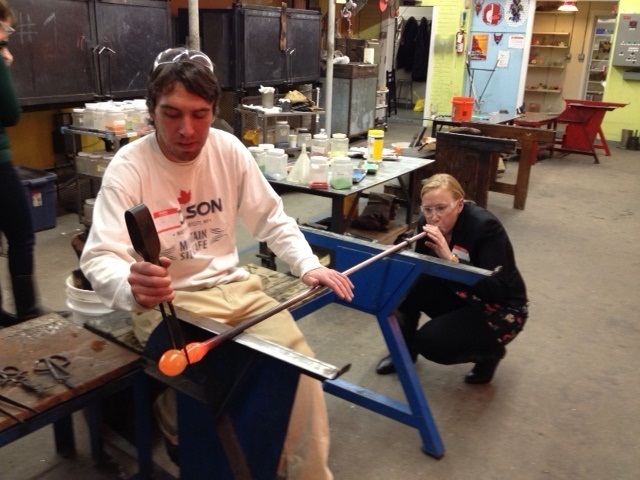 I have never been able to whistle, and I had only slightly more luck blowing glass. My motivation for visiting the Diablo Glass School was simple: I needed a great Christmas gift! I really like to give thoughtful, preferably, homemade gifts. I have already knitted gifts for everyone I possibly can, and I needed to take it up a notch. 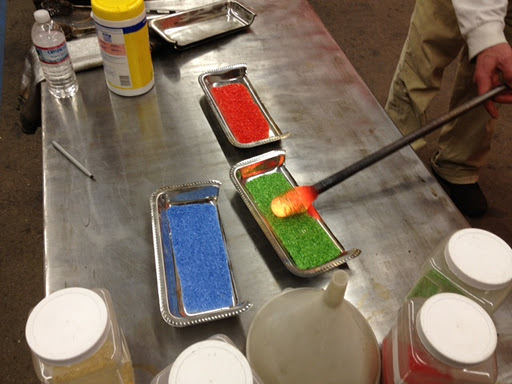 So when a friend suggested we try glass blowing I jumped at the idea! We arrived at the glass school — which resembled a large unfinished basement with large old furnaces –and the warmth from the ovens chased away my winter chill. But I was suddenly overwhelmed with the long list of rules I was told I needed to abide by so that I would not get burned. The glass can get as hot as 2,000 degrees, which would not only chase away any chill, but would most likely melt away my skin as well. Our teacher said he would be with me every step of the way, but I wanted to make sure he would literally be next to me, in case I forgot and handled the metal blow pipe too far down where it is still still conducting heat. 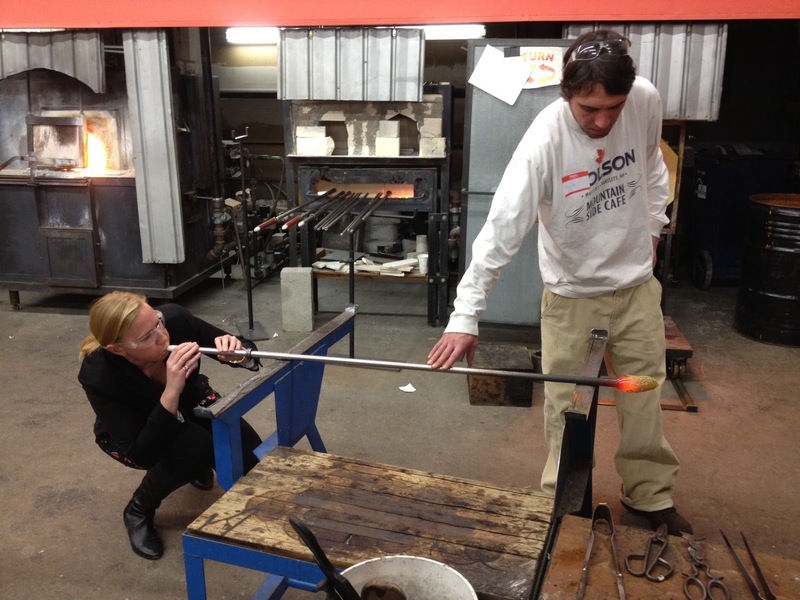 To blow glass you need the aforementioned long metal pipe called a blow pipe. It is hollow so that when you have a dollop of melting glass on its end, you can blow into the pipe and inflate your glassy blob. I grabbed my pipe and stuck it into a furnace and collected an Anjou pear-size serving of glass. This is when the tough part starts. The glass is so hot and malleable that you must continuously spin the pipe to keep the glass centered on the end of the wand, and prevent it from dripping off the end of the pipe like molasses. 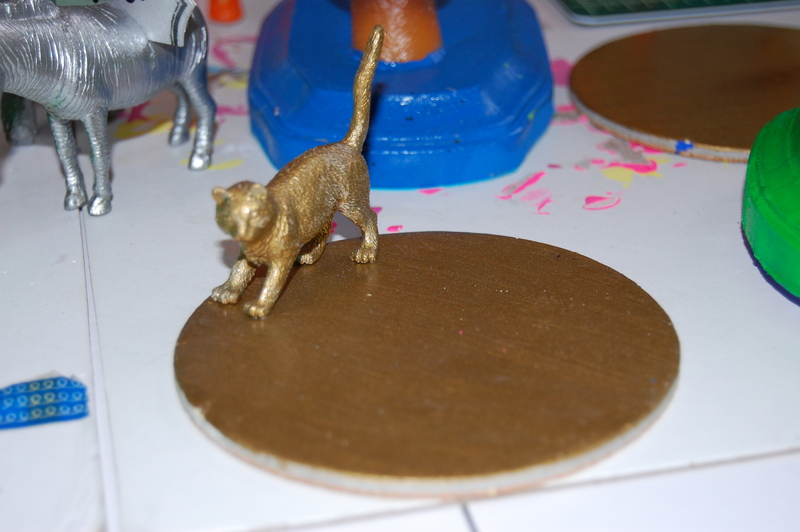 Then you add color to your blob by rolling it in piles of what resembles colored kitty litter. The chromatic morsels are in fact glass, and once they are heated along with my blob ‘o glass their color bleeds to create a beautiful speckled affect. Once you have colored your blob the really difficult – and I felt totally embarrassing—part of the process begins: blowing the glass. The name really does say it all, you blow into the opposite end of the blow pipe as your glass blob and the air you exhale inflates the glass. The problem was not that I didn’t know what to do, our teacher gave very clear instructions, but it was those instructions and my inability to follow them that made for a few ridiculous moments. Those were the directions I was given as the teacher rolled the blow pipe over his knees to keep the glass centered on the pipe. First off, his directions were making me laugh making it difficult to sustain a long exhale into the pipe. Secondly, the rolling of the pipe mean I had to move my mouth side-to-side with the pipe, while blowing and simultaneously attempting to stifle laughter. Lastly, no matter if I was blowing hard or soft I saw no effect on my glass. I imagined it would be like blowing up a balloon, but no, nothing. My glass did no inflate. I felt ridiculous. In my defense the two friends I was with were also laughing. One even had to put her head inside her turtleneck collar to prevent a full-blown belly laugh at my expense. Thankfully Diablo makes this process fool-proof (emphasis on the “fool”). Once I did as much as I could (I was blowing really hard with no noticeable effect on my glass) my teacher made some adjustments to my work so that it did eventually resemble an ornament. 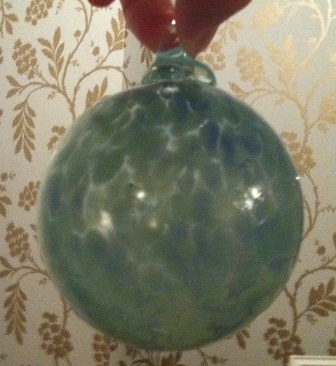 He took my glass ball off the blow pipe, used some hot glass to create a hook for hanging the popped it in an over to slowly bring down the ornaments temperature. 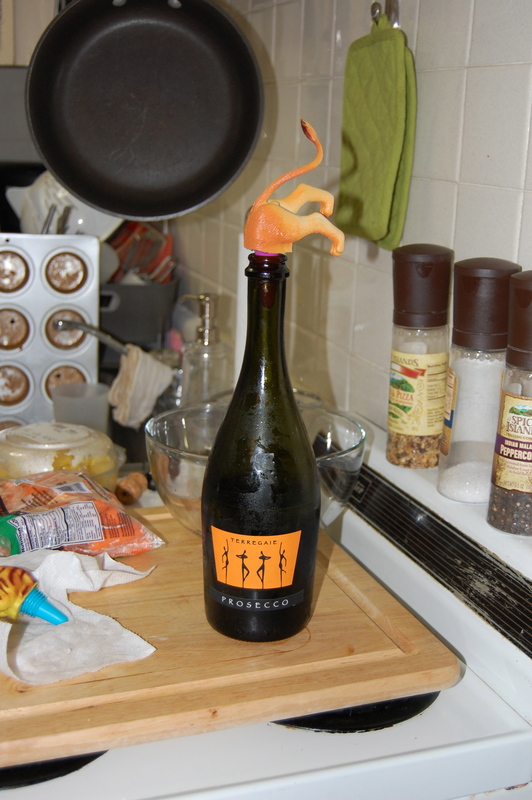 (If you let it sit out at room temperature the glass would crack). I am certainly not Chihuly I don’t think blowing glass is my next passion, but I have a beautiful blue and green ornament that will look amazing on a tree and will always make me giggle and dream of a day that I can talk about blowing and not lose it!